As one of the first users of the technology Accent Eyecare has long reaped the rewards of onsite lens production. 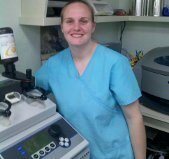 “We have had several patients that have had broken frames and unable to complete their daily tasks, with having the Q-2100 machine, We are able to provide the customer with a great quality lens and get the job completed in the same day,” said Roxanne. “Customers are amazed that they are able to get a lens with AR and photochromics with a one-day turn around. I love being about to provide that type of service to our customers,” she added.